There was no game for Huntingdon Town Ladies FC today. So, unable to do my usual factual and totally unbiased match report for the website I thought I would update the player bio section. But then I thought producing unofficial bios would be far more fun. So here is a brief low down on the wonderful bunch at HTLFC. Captain Bowd sets a good example by always turning up to training in perfectly colour coordinated clothing. That’ll be me. Spends too much time chatting to the spectators and forgets to play football, especially when in goal. Would rather be in Starbucks than on the footy pitch. Abi came back from Oz to play for us, among other, less important things, like love. Silent but deadly. Emma doesn’t speak much but when she does her voice is surprisingly posh. Essex girl Hollie doesn’t like to get her nails dirty. Only ever scores worldies. Winner of the 2011-12 Most Improved Behaviour Award. Stef doesn’t suffer fools gladly. Tash gave up a career in Tesco to become a teacher. Every little helps. Sian is one of the reasons we wear shin pads at training. If she shoots, get out of the way! So tiny she can run through the oppositions legs without them noticing. She is a Kat that keeps chickens. Kat holds good barbecues….just don’t tell the chickens. Keeper of the first aid kit, we often have to remind Dr J that she is not a real doctor. Says ‘Good God’ when shocked, which seems to be quite often around this bunch. The West Brom whippet. Media favourite, Knoxie, just can’t keep out of the papers. Super Spurs fan. If there was an award for most neatly packed kit bag, Sophie would win hands down. Looks just like her twin, Beth. Wears yellow boots and plays in goal so we know it is Jo. Looks just like her twin, Jo. Plays on the pitch and doesn’t wear yellow boots so we know it is Beth. Terrifies opposition with her tendency to stamp. She is not a violent player, she just runs really loudly! Has made two ‘almost assists’ this season. Sleeps most of the time but if she happens to be awake on a Sunday afternoon she is a pretty nifty player. Megan’s legs have a mind of their own. She does tricks so complicated; even Megan doesn’t know how she did them. An actual power house, Babs is the other reason we wear shin pads at training. Karen defies the laws of aging. Would play with a cigarette in her mouth if she could get away with it. Calls Lemming ‘Melly’ and no one has the heart to tell him otherwise. He likes to fold bibs. Back in 2007, in New York’s Carnegie Hall, Harry Potter author JK Rowling announced one of the main characters, Albus Dumbledore, the Hogwarts School Headmaster, is gay. But did she realise the significance of this revelation for the advancement of gay rights for a future generation? Love it or hate it there is no denying the success of the Harry Potter phenomenon. The books have been published in 200 countries and in 69 different languages. Over 450 million books have been sold, with the final instalment ‘Harry Potter and the Deathly Hallows’ selling 11 million copies on its first day of publication. Harry Potter and the Sorcerer’s Stone was the first children’s book to appear on the New York Times best seller list since EB White’s Charlotte’s Web in 1952. The series remained on the list for ten years and took up several top spaces forcing the creation of a separate children’s list to make room for other titles. Harry Potter has been in the lime light since the first book was released to great acclaim in 1997. Since then, with each book and subsequent film release the series became the most successful movie franchise of all time. Harry Potter has become part of our culture. Tourists flock to the various locations where Harry Potter was filmed, from London’s Leadenhall Market which is the entrance to ‘Diagon Alley’, to Alnwick Castle near Newcastle, which starred as the grounds of Hogwarts School of Witchcraft and Wizardry in the first two films. Although the series has come to an end and the films have all been released, Pottermania remains in full swing. The much anticipated release of the Pottermore website gives fans an online experience to share and participate in the stories and discover previously unreleased information from JK herself. After her revelation about Dumbledore, who knows what she will reveal next? Readers can also, for the first time, purchase Harry Potter e-books from the Pottermore site, so there is still plenty to keep the Potterheads happy. When pressed on Dumbledore’s love life, JK explained that Dumbledore was smitten with Gellert Grindelwald in his youth. Grindelwald held racist beliefs and was making plans for wizards to rule and to suppress the muggles (non-magical people). At the time, Dumbledore was infatuated by the wizard who was as talented as himself. The youthful obsession was over very quickly and eventually Dumbledore defeated Grindelwald in a battle between good and evil. Dumbledore realised he was being a fool, not for being in love with a male but for putting his trust in the wrong person. “Falling in love can blind us to an extent,” said Rowling. Even some gay readers were not happy with the revelation. Love conquers all is a strong theme throughout the books and most of the other lead characters meet their soul mates at an early age and go on to have happy heterosexual relationships. But the only gay character, Dumbledore, has a negative experience with the wayward Grindelwald and goes on to live the rest of his life celibate. So not really a happy ever after ending for the gay hero. For many readers, Dumbledore’s sexuality was not that obvious from the books and therefore some people feel they should have been left to make up their own minds. However, JK herself believes that many adult fans had spotted that Dumbledore’s feelings for Grindelwald were an infatuation while children and other readers just saw their relationship as a very devoted friendship. Despite his misguided youthful experiences with the delinquent Grindelwald, Dumbledore is a fantastic role model, and it can only be positive that Rowling did not hesitate in answering about the character’s sexuality when questioned. Dumbledore is the moral advisor to Harry and the other students and the most successful headmaster of Hogwarts. JK has shown he can be gay, and still be wise, kind, honest and the greatest wizard of all time. Although Harry is the main character, readers and Potter film fanatics recognise Dumbledore as Harry’s mentor and guide. The brains behind the operations, he is central to the success of the boy wizard. Dumbledore is beloved by the masses, from children who grew up with the books to adults captivated by the magic. That this character, known and loved by millions across the globe, is homosexual marks a massive step forward for gay rights. A dork’s guide to being cool. Some people are just plain cool. Unfortunately, most of us are not! This blog will allow even the nerdiest amongst us to experience the alluring world of cool. The key to coolness is copying the crowds. Follow these six simple steps to fit in with the popular people and shake off those geeky friends. The first step to appearing cool is to wear the right brands. The easiest way to do this is to copy the crowd. Hang around outside Hollister. Wait for a group of young, cool looking kids and follow them in. Stick close to the group and make note of the items they pick up and approve of. Once they have moved away, swoop in and examine the garments. To save money, only buy outer wear such as hoodies or jackets, where the logo will be clearly visible. That way you can still wear your Star Wars t-shirt underneath and no-one will ever know. Beware: The staff will say hello and make friendly chat. Just return the greeting and walk away, they do not really want to be your friend or hear about your day. Top Tip: Wear dark sunglasses while outside the shop. Once inside, remove your shades. Your eyes should now be adjusted to the dim lighting allowing you to see the colour of the clothes you are purchasing. It is important you know the current slang. Using last year’s lingo could easily expose your inner geek. Now you have your Hollister hoodie, you should be safe to approach the skate park without being beaten up. Take a seat on the bench and listen to the language used. Do not get out your X-men comic, this will only attract unwanted attention. Instead, put in some ear phones and pretend to be listening to some hot tunes. Make note of whether the words are used to mean good or bad. Now impress your peers with your new cool vocabulary. Beware: Be careful who you use this street talk with. While skaters may praise each other by exclaiming a trick was ‘sick’, the old lady next door will be horrified if you declare her much loved Jack Russell is sick, even if you meant it as a compliment. Knowing what tunes are in, and more importantly knowing what is out, is crucial to keep your cool demeanour alive. Again, the key to this is copying the crowd. Find out what the cool people are listening to, by using apps like Shazam. Wander up when cool people are showing off their tunes and let Shazam work out what is playing. It is important to be able to rattle off some cool band names if asked what you are listening to. No-one need know that the Dungeons and Dragons audio book is really playing through your headphones. Top Tip: Wear big headphones. These say I’m too cool to talk to you. My music is far more interesting. This should prevent you from being questioned. 4. What are you chatting about? Repeat the mantra: The key to coolness is copying the crowd. What are the cool people talking about? Put your big headphones on and do a spot of eaves-dropping. Topics are likely to be about sports, X-box games, fashion or music. Observe conversations initially and then utilise your nerd skills to research some key facts about the topics enabling you to join in next time. Note: Only research key facts, no one will be impressed by a spread-sheet detailing all of the Premiership player appearances and statistics since the league began. Now you have some basic knowledge of the cool people’s past times you will know where to find them and hang out. Join a sports club. Go to the shops they have mentioned or to the cinema to see the film they were talking about. Top Tip: Sit next to the cool people wherever you can, in the canteen, in the cinema or in the bar. Passers-by will assume you are part of the group thus elevating your social status. Beware: Your street credibility could crash back to zero if you are seen going into Chess Club. Now you have some cool clothes and know the cool crowd better it’s time to turn that funky music up and throw a party! Only invite the cool people. That means leaving your old geeky friends behind but don’t worry they will be quite happy playing World of Warcraft at home. Join in with the chat, try out your new lingo, relax and enjoy your new status. Top Tip: Rig up a device at the end of the street to play a loud police siren, and flash blue lights, remotely controlled from your mobile. Once activated, the crowd will scarper. This allows you to end the party at your convenience, whilst ensuring the party is remembered for the foreseeable future. So you have made it to coolness by following these easy steps. From now on it’s easy, just continue copying the crowd and don’t feel bad about ditching your dorky childhood pals. It’s for their own good. If they want to be your friend they will have to turn cool and who better to learn from, than the newly crowned King of Cool. That’s you. Lemming, ate her Freddo while the substitutes and supporters made their score predictions for the match. Hollie was very optimistic, foreseeing an 11-1 win for Huntingdon. The manager’s son Jack had chips but everyone else was disappointed he didn’t share. On the pitch, exciting events were occurring. A Fulbourn goal was disallowed, Stef Day won a header by leaping through the air like a salmon and Rachael Bowd, aka Bowdy, made a tackle without fouling. The phone then said, ‘Potato,’ again, bringing everyone’s attention back to the sidelines. Claire Knox, aka Knoxie, taught everyone that penguins mate for life and that the boy penguin gives the girl penguin the best pebble he can find from the beach. At half time, Lemming enjoyed a coffee while Abbey opted for a cup of tea. In the second half, there was a moment of horror as Jo McGoff’s goal kick almost hit an unsuspecting dog. Both managers made the most of the repeat substitution rule. Players were rolled on and off the pitch. Emma Clarke was rolled back on but didn’t have a shirt so Jo Bull, aka Jo Bull, had to hand hers over as she rolled off the pitch. The referee threatened to report us for not having enough shirts. Back on the pitch, Emma made it into the penalty box but fell over. Lemming’s shouts for a penalty were ignored. Just as it seemed the game was heading for extra time Karen Williams, aka Tyson, popped up with a headed goal to send Huntingdon through to the next action packed round of the league cup. The official match report can be found by clicking here. Which do you think is best? Some People are Vegetarian – Get Over It! Let’s get it all out in the open now. I’ll admit it, come clean and out of the closet. Please don’t be shocked, scared or angry. I’m vegetarian! No big deal. I just choose not to eat meat. However, my choice seems to worry, offend or confuse some people and the apparently shocking news often provokes the need for a barrage of questions. Don’t get me wrong, I don’t mind general curiosity questions such as how long I have been vegetarian or whether I cook with quorn or tofu. Those are fine. It’s when the questioning goes into my moral values that really gets my goat. Understandably, some meat lovers are concerned I will frown upon them for eating meat around me. I won’t. Then there are people who think I will try to turn them off their meat with talk of animal rights or the health benefits of a vegetarian diet. Fear not. I don’t care if people eat meat, are vegan, gluten free or a cannibal, well maybe that last one would bother me, but you get the idea. People can eat what they like. That is their choice. And that is my point. If I happen to fail this cross examination I will probably be accused of being a hypocrite. A hypocrite? I have never claimed to be saving the world or every animal. All I am saying is I don’t eat meat! The point is, I would never dream of asking someone why they ate meat. In the same way as I wouldn’t ask someone which party they vote for. It’s a personal choice and none of my business. I don’t want to get into a moral debate every mealtime. I just don’t eat meat. That is all. 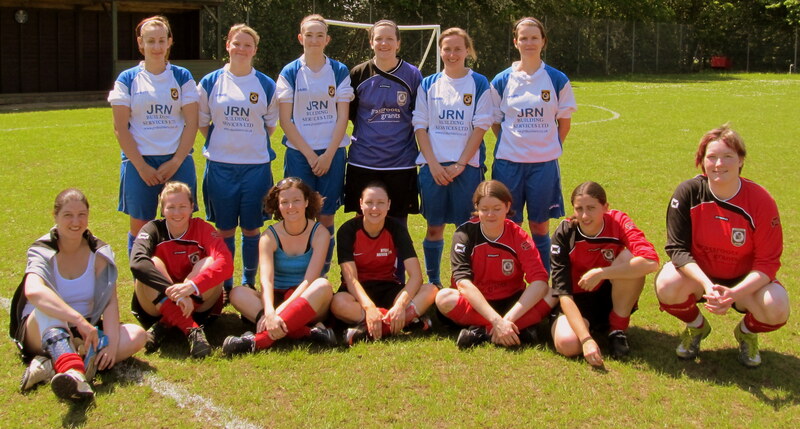 The 2012-13 season marks a new start for Huntingdon Town Ladies FC. After twenty years in the Eastern Region Women’s League the club have decided to switch to the S-Tech Cambridgeshire Women’s League. Huntingdon got off to a good start yesterday (Sunday 2nd Sept) with an 8-0 win over Wisbech St Mary Yellow. The club formed twenty years ago when women’s teams were few and far between and travelling across the region to play against other teams was a necessity. Now, after the huge growth in women’s football there are more good quality local teams and the Huntingdon players are looking forward to playing against some new opposition. Full match reports can be found here. Ever thought your favorite football team’s ground was cursed? Well maybe it is. This article covers the supposed hauntings and jinxes on English football grounds and the actions some clubs have taken to rid their club of demons and curses. Click here to read the full article. This article takes a humorous look at common football cliches and the confusion these can create for children who are starting to play the game. Click here to read.